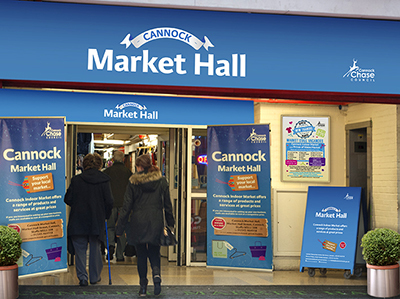 There are a number of pay and display car parks within Cannock town centre, the nearest one being the Multi-Storey car park which is situated directly above Cannock Market Hall (some car parks have height restrictions). Based on Ordnance Survey mapping (C) Crown Copyright. All rights reserved. Cannock Chase District Council, Licence No. 100019754, 2014. The Ordnance Survey map data included within this publication is provided by Cannock Chase District Council under licence from the Ordnance Survey in order to display where Cannock Market is located. Persons viewing this mapping should contact Ordnance Survey copyright for advice where they wish to licence Ordnance Survey map data for their own use. Large menu available of hot and cold food. Eat in or takeaway. OAP and kids specials. Large 11 item breakfast our specialty. A warm and friendly welcome awaits all customers. Many styles and treatments available at competitive prices. Pop in for a chat, no appointment needed, OAP specials everday. Ask for Louise. We are also happy to do gents hair cuts. For all your smoking requirements. Stockists of Kendal Rolling and pipe tobacco. Rolling papers, filtertips, lighters, pipes and smokers sundries. All kinds of smoking paraphenalia. Vapour pens and liquids now also available. Ladies and gents fine quality underwear for the more mature person. Including vests, briefs, nightwear and underskirts for ladies. Singlets, trunks, Y fronts and nightwear for men. Thermals for both men and women. For all your accessories. Buttons, zips, ribbons, braid, lace, tie backs, bobbies, needles etc. Established for over 40 years. School uniforms, childrenswear, menswear (jumpers, trousers, jeans and cardigans up to 6XL), and ladies fashion. Wide range available. DO YOU NEED: A new zip? DO YOU NEED: Any garment shortened? DO YOU NEED: To alter any garment? DO YOU NEED: To shorten/repair curtains? DO YOU NEED: Leather garments repaired, especially bikers leathers? Door mats, kitchen mats, hall runners, Non-slip mats for laminate floors, bath sets, washables, luxury silk and wool rugs. A large selection of children's rugs. Lots of choice; excellent quality. An extensive range of cosmetics and ladies and men's fragrances available. All at very competitive prices. Specialist home brew retailer. Stock all main brands. All equipment and kit available at very competitive prices. Fashion items for the more mature lady, including skirts, blouses, cardigans and trousers. Specialists in large and petite sizes. A wide range of pet food's, treats and toys, treatments and remedies. Top quality wild bird seed available. Friendly service- just ask for Paul. Ladies and gents hosiery, hankies, scarves, gloves and all the latest Fishnet styles. Trading for 30 years. Genuine Swiss watch batteries fitted, Watch glass replaced, straps fitted, bracelets altered. Plus a wide range of watches and accessories available. Engraving service available. New key cutting service now also available. We are specialists in new and used mobile phones and Ipod accessories. Our product range includes batteries, body gloves, facias, spare parts, mains chargers, and hands free car kits. We also specialise in unlocking and repairs. Men's ladies and children's coats and jackets stocked. Work wear also available. Best Prices on loose fabric in Cannock. Lining for curtains, good quality curtain fabric, silk fabrics, linen, dress fabric and much more. Fat quarters quality fabric available. Come and view our new Autumn/Winter fabrics displayed in store. A new range of net curtains now also available. STALL 62, 63, 65 BRAND NEW UNITS AVAILABLE TO RENT IN PRIME LOCATION! FOR STALL ENQUIRIES PLEASE CONTACT THE MARKETS TEAM ON 01543 464558. CASUAL DAY TRADERS ALSO NOW WELCOME. For all your floral requirements. Please contact the markets team on 01543 464558 for enquiries.